Summary Second HomePlug AV2-MIMO adapter based on Qualcomm's QCA7500 chipset. Updated 7/15/2015: Product has been retested. 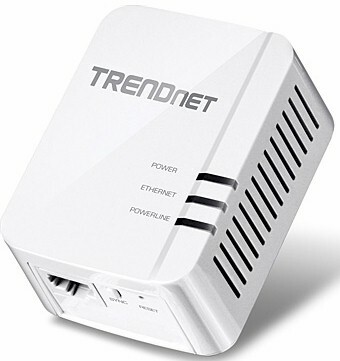 TRENDnet just started shipping its HomePlug AV2 MIMO powerline adapter, which was announced well over a year ago. ZyXEL beat them handily to market with the PLA5405, which we reviewed last November, the first AV2 MIMO adapter based on Qualcomm's QCA7500 . TRENDnet tried to make a big splash by reducing its two-adapter TPL-420E2K kit to $99 when it changed the ship date last June. But the list price rose to $130 in February when TRENDnet announced first shipment. NewEgg, however, has posted a $110 price, which is reinforced by an exclusive deal for the time being. ZyXEL's adapter started out priced at $140 , also with a NewEgg exclusive deal. But the two adapter kit has since fallen to around $93. So are TRENDnet's adapters worth the extra $17 (or so)? NOTE: In this review, I'll be referring to the product as the TPL-420E. It is currently available only as the TPL-420E2K kit of two adapters. Like the ZyXEL PLA5405, we class the TPL-420E as a 1 Gbps MIMO adapter. But also like the PLA5405, TRENDnet is marketing the TPL-420E as a "1200 Mbps" adapter. ... but it's thicker. The TRENDnet also has much more ventilation. Its three-prong plug positions the adapter body so it won't block the adjacent outlet in a standard U.S. duplex, as shown in the photo below. The serial number label specs a 100 - 240 VAC 50 / 60 Hz operating range. The User Guide says the adapter goes into power-saving mode "when there is no network traffic for more than 10~20 minutes". I didn't verify this. The TPL-420E is the second sighting of Qualcomm's QCA7500 HomePlug AV2 MIMO IC. Check the PLA5405 review if you'd like to see the device block diagram, or just download the data sheet. The 420E's inside photo shows the QCA7500 at lower center. That's an AR8035 Gigabit Ethernet PHY right above it. There is no separate analog front end (AFE) device; that function is built into the QCA7500. This board is plugged into another board below it that has the wall plug and mostly passive components. The 420E didn't get very hot during testing, despite its lack of any heatsinks or thermal pads. I guess TRENDnet figured the large and plentiful side ventilation holes would keep it cool enough. Note there are no vent slots on top of the device. TRENDnet includes a Power Packet Utility on the CD packed in the 420E2K's box. You can also download it from the product's support page. It requires WinPcap 4.1.3, which will also be installed if it isn't already. The screenshot below shows the Utility, which doesn't expose the incomprehensible QoS controls some other powerline utilities do. The screenshot was taken with both adapters plugged into the same power strip, so the 930 Mbps (link?) rate is as good as it got in my testing. You can also use the utility to set the encryption key if you don't want to use the pushbutton method. I tested the TPL-420E using our standard powerline test procedure, with all results entered into the Powerline Performance Charts. We now have two AV2-M1000 class devices to compare, so the charts include ZyXEL's PLA5405. The Downlink Throughput plot below shows the TPL-420E having the highest throughput in the best-case same-outlet Location A and worst-case Location E. The 420E's 433 Mbps is 30% higher than the ZyXEL's throughput. But products are even at the medium-range location C test. Uplink results show the 420E with a 13% edge at Location A and dropping to about half that in the other two locations. The simultaneous up /downlink IxChariot plot for the TPL-420E at Location A shows higher average uplink throughput, but with both trading positions throughout the one minute test. Note throughput totals just over 480 Mbps, a bit better than the ZyXEL's 419 Mbps in the same test. Adding more simultaneous streams adds a bit more bandwidth. With two up/downlink streams running simultaneously, total throughput moves up around 4% more to a tad over 500 Mbps. Note that uplink in each of the pairs is still favored over downlink. Also note throughput is fairly evenly distributed between the two streams in each direction. I once again ran Location E noise tests. Location E is where most of my worst powerline noise sources (our smartphone and tablet chargers) live. The tests basically plug and unplug a particularly noisy wall-wart while an IxChariot stream is running and compare the results to a stream with all noise sources unplugged. The composite plot below compares the baseline Location E downlink test, run with all noise sources unplugged with a run with the noise source plugged in then uplugged at the 30 second mark. Throughput recovers to the maximum no-noise-source value within a few seconds. Very impressive! I also ran a test with all noise sources plugged in to see the adapter would try to compensate. The no-noise source plot makes a jump about 8 seconds in. But the lower plot with multiple noise sources plugged in shows no sign of trying to tune out the noise and improve throughput. Using the Powerline Ranker to get a bottom line shows the TRENDnet TPL-420E2K kit ranked #1 and the ZyXEL PLA5404KIT #2. The Ranker Performance summary for both devices shows the TRENDnet beating the ZyXEL on all three ranking qualities. Keep in mind when deciding whether to spend a bit more for the TRENDnet that AV2 MIMO technology is like wireless MIMO. You get the big throughput numbers only with strongest signals and throughput falls off pretty quickly with signal level. The clip from the Powerline Downlink Chart below showing Location E (worst case) throughput also shows that there are cheaper non-MIMO alternatives that can also get you above 100 Mbps across an average-sized home. Still, the ability to get a 100 Mbps Ethernet port just about anywhere in your home for around $100 sure beats paying an electrician to fish CAT6 through walls!